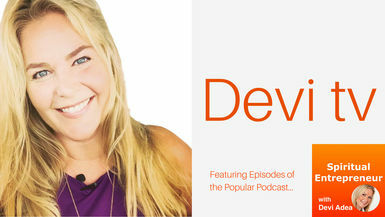 In this episode, Devi chats with Devin Galaudet about "Kabbalah" and the Western Mysteries. Devin is the editor and publisher of the In The Know Traveler and In The Know Bride, which chronicles his endeavor to marry his wife in 100 countries around the world. (20 times in 15 countries, so far). Devin has written for the Huffington Post, The Good Men Project and many others. A frequently sought-after guest expert on relationship and travel, Devin has appeared on FOX-TV, NBC-TV, Reinvention Radio, the California Writers Coalition, JohnnyJet.com, the Jewish Journal, and hundreds of podcasts. And Devin’s memoir, 10,000 Miles with my Dead Father’s Ashes, is available "everywhere" and was officially released September 18. Resources Mentioned: “Sefer Yetzirah” by Aryeh Kaplan and “The Chicken Qabalah of Rabbi Ben Clifford” by Lon Milo Duquette.